In a surprise but very welcome development, the N82 and both variants of the N95 have received a firmware update, taking them to v35. 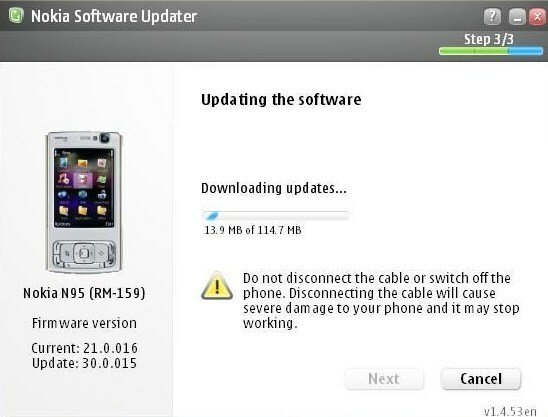 Specifically, the N95 (RM-159) is upto 35.0.02 & the N95 8GB (RM-320) is at 35.0.01 and the latest firmware for the N82 is now v35.0.002. There is no changelog available yet and I am going through my drawers to look for my own N95 to update. Just a word of caution before you dive in yourself, just remember there is no user data preservation, so make sure you backup before you hit the NSU. Since S60/Symbian bashing has become the new thing lately, a lot of rumours proclaiming that Nokia will ditch Symbian were expected. However, one piece of ‘news’ that has really sent the rumour mills into a tizzy is this piece published in UK’s Guardian newspaper, ‘quoting industry insiders’, claiming that Nokia will embrace Android to keep afloat in the smartphone wars and that the announcement of a Android running Nokia smartphone was expected this Nokia World, September 2-3. What is my reaction? Hype and very/no little substance. If you think about it camly, I’m sure you will see through it as well. Nokia is the world’s biggest handset manufacturer, it already runs Symbian on its smartphones and Maemo, its homegrown flavour of Linux, on its Internet Tablets and if it were to make an Android device now, it would be equivalent of saying ‘we couldn’t make a decent OS on our own and now we will compete with other manufacturers on the strength on our hardware alone’. Like I said, virtually impossible. That being said, will there be a new Linux running device announced at Nokia World? Quite possibly. It will be the long rumoured successor to the N810 that runs Maemo and has the capability of making calls. The N900 perhaps. GPS, along with an accelerometer. Though the renders we’ve seen show two lens-like circles near the screen, we’ve got no word on what’s behind them. However, we feel safe in assuming that its a proximity sensor and a front-facing camera. In all of the renders we’ve seen, it appears to be running Maemo 5. Contacts has some sort of status sharing built in, allowing you to share your status, location, and mood. Support for Contacts on Ovi and Google Talk. Nokia intends to have at least a dozen add-on apps available at launch, including a game called “Bounce”, a Jaiku/Twitter app called “Mauku”, and a few widgets. Perhaps for the final time, Nokia has rolled out a new firmware for the Nokia N95 – v31.0.014. The new firmware apparently just brings bug fixes and perhaps an end to the ‘platform hack’. Since the phone doesn’t support UDP (User Data Preservation) make sure you back up the device before you update via the NSU. If you are keen on hacking, hang on to v30 as this firmware has nothing special to offer, no transitions N81 style and so on. Nokia seems to have made it a habbit, close on the heels of the N95 8GB the Nokia N95 has also received its long awaited firmware update and now stands at v30.0.015. The good news is that the firmware is also available via the NSU. The new UI that the N81 got, hasn’t made it to the N95, although Automatic Screen Rotation has made an appearance. Also, in case you care, the ‘hack’ still works. Will update this post as soon as I have more details. E71 v/s E90 v/s T9 – Which Is The Fastest? One of the reasons the E71 was so hotly anticipated was because it brought QWERTY back into the Eseries after quite a while, the last Eseries in the same form factor being the E61i. But because of its size, it created doubts in the minds of a lot of people about its real world usability. I have been a Nseries man for a long time and since it still offers no QWERTY, I became really proficient with T9 and never really felt the need for QWERTY. A few months ago I bought my first Eseries device, the E90 and still found myself using T9 on it more than the internal keyboard. It was just too wide for me, however with the E71 that changed. This in my opinion is the best form factor for a QWERTY device and when coupled with predictive text and auto correct, it makes for a deadly combo. This post pits the E90 and a T9 based device, against the E71 and we try and find out which is the best text entry solution. This one hit me completely out of the blue. Apparently a chap named Jovan has managed to get Android up and running on a Nokia N95. Yes, the same Nokia N95 that runs the S60 operating system. He claims to now have a dual boot between Andriod and S60. He backs up this claim by the video above and another one below, with which he demoes Google Maps and the Dialer. After playing with this setup he says, “My impressions after using it are all positive, its much faster than Symbian, looks better, thought some functions still dont work, and the 3D engine is slow and lags”. First of all, congratulations on the mod. However I don’t really know how I feel, its great to see so much control in the user’s hands but S60 is an OS that I love and anything that displaces it, well.. The second video after the break.